A spokesperson said, “Don’t miss the opportunity to go visit the Carole Holding pop-up shop, located in the Washington Mall. 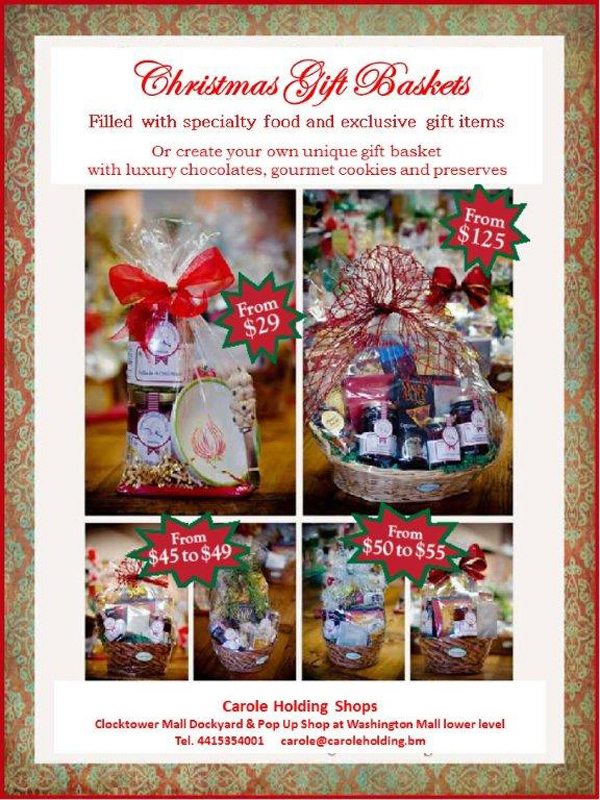 The shop is filled with an array of Gourmet gift baskets some ready-made or select from her display of product available. “Carole will design a basket especially for you. In addition, Carole’s Bacardi rum cakes may be purchased in four different flavours. “The cakes made to Carole’s recipe include the finest fresh ingredients – fresh eggs, butter, Hershey chocolate, strawberries and pecan nuts, and of course different Bacardi Rums. Grab a jar of her Bermuda Onion marmalade, Carole’s Sweet Ginger Jam with Bacardi rum, or Strawberry and Champagne jam for your stocking stuffers. Great idea, will be doing this.